This article is a short summary of Puzzle & Dragons Z + Puzzle & Dragons: Super Mario Bros. Edition. Puzzle & Dragons Z + Puzzle & Dragons: Super Mario Bros. 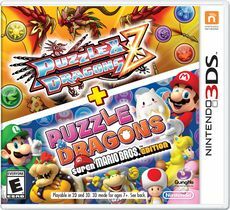 Edition is a compilation release of two Nintendo 3DS games in GungHo Online Entertainment's Puzzle & Dragons series: the spin-off game Puzzle & Dragons Z (パズドラZ), and the crossover title Puzzle & Dragons: Super Mario Bros. Edition (パズル＆ドラゴンズ スーパーマリオエディション), originally released individually in Japan by GungHo Online Entertainment in May 2013 and April 2015 respectively. The compilation version was only released internationally by Nintendo, in May 2015. Battle through the Mushroom Kingdom with Mario™ and Luigi™! Recruit 80+ enemies like Goombas and Piranha Plants. Collect items to grow and evolve your allies. Save Dracomacia from destruction in an epic puzzle-RPG! Join the Rangers of Zed City and battle through dungeons as you fight Paradox, an evil group bent on destruction! Collect and evolve 250+ monsters. Match combos to do massive damage! In Puzzle & Dragons: Super Mario Bros. Edition, a set of orbs suddenly appear in front of Princess Peach's Castle one day. The princess invites Mario to the castle to show them to him, but when he arrives he is given a letter from Bowser stating that he has kidnapped the princess and taken the orbs. Mario goes on a quest to save the princess from Bowser. A demo for Puzzle & Dragons Z + Puzzle & Dragons: Super Mario Bros. Edition was released on the Nintendo eShop on April 30, 2015. The demo can be played an unlimited number of times, and requires 641 blocks to download. Only the Puzzle & Dragons: Super Mario Bros. Edition game is accessible. The demo features two stages: Intro, a basic overworld stage; and Expert, a more difficult stage unlocked after clearing Intro that is set underground and gives players higher-level characters and enemies. NA: December 24, 2015 Adds new leaders, adds additional Free and Fixed Challenges, adds World Rankings. This page was last edited on 12 July 2017, at 03:00.